Last weekend we traveled to Washington, D.C. to visit a friend who works in the Obama administration. My first stop on Saturday was the Lincoln Memorial, where I hoped to get an empty early morning wide-angle shot of the Lincoln Memorial, and a sunrise photo of the Washington Monument with the United States Capitol Building behind it. Since we arrived late Friday night and left early Sunday morning, Saturday was my only day for sunrise shooting. Luckily, I got the empty shot I wanted of Lincoln Memorial. Unfortunately, the sky was overcast that morning, so there was no sunrise. Even without a nice sky, Washington, D.C. was a great place for photography. On the last photo I posted, I posed the question of when you all travel, if you have the choice. That was prompted by our two consecutive weekends in Atlanta and Washington, D.C., and my realization that we chose poor times to travel. Don’t get me wrong, we had excellent times in both places, but it was a poor time to travel. Since we travel on weekends and don’t have kids, we can effectively travel whenever. We like deals, so “whenever” has come to mean when airfare is cheap. January is one of the cheapest months of the year to travel, and we booked our airfare to Atlanta and Washington, D.C. back in December when AirTran was having a sale. Round-trip airfare was less than $100 for Atlanta, and $110 for Washington, D.C., so we jumped on it. We were able to get late flights on both Fridays (which is what we wanted), but in both cases, we had to fly back early on Sunday morning. Our flight from Atlanta departed at 9 am, and our flight from Washington, D.C. departed at 6 am. This was our first mistake. If you’re going to take a weekend trip, at least stretch that weekend trip as long as possible, even if it means paying a little more. Our second mistake was going in January to begin with. Photography is a big part of these trips, and neither location is especially photogenic in January. Atlanta has fairly “blah” winter weather, and Washington, D.C.’s gorgeous cherry blossoms are still months from blooming in January. More importantly, and only somewhat related to photography, both locations are COLD in January without any benefit to that cold. We try to avoid renting a car when we travel, so our trips involve a lot of walking. Walking in the cold is, obviously, not a lot of fun. This is especially true for me, as I’m usually up a couple hours before sunrise to walk to wherever I need to get, and I go out late at night to take nighttime photos when it’s coldest. All told, I walked about 15 miles in Washington, D.C. on Saturday, and froze in the process! The point of this story is that although you can save some money by traveling during low seasons, sometimes it’s better to pay a little more to travel during a better time of year and improve the quality of the trip. This is something we know, but we just didn’t consider it when traveling to these locations for some odd reason. It’s typically just as cheap to travel during the fall months (and much warmer! ), so if we simply waited until September, we probably would have been a lot warmer when visiting D.C. (and had some nice fall colors to photograph)! …Now, on the flip side, I carefully put together an itinerary that will take me to Yosemite National Park in a couple of weeks in the freezing cold (and without a hotel room my first night! ), but that’s entirely by design. Despite the cold, there are some huge benefits to visiting Yosemite during the winter. It’s not like Atlanta or D.C. where you get the cold but no discernible benefits from that cold! Photographed with a Nikon D600 and the Nikon 14-24mm f/2.8. HDR processing in Photomatix. I still don’t know what I’m doing in there well enough to explain how I got the results I did. Basically, I just moved around random sliders until I found a result I liked. I think I went a little stronger with the HDR here than I did with the Versailles photo. I hope its still realistic, and I know a lot of you indicated that you prefer realistic HDR (for what it’s worth, at some point I’ll probably experiment with surreal HDR, too–I want to try a variety of styles going forward!). From there, I did finishing in Photoshop CS6, layering my regular (non-HDR) “0” exposure on top of the HDR to reduce its intensity and adjusted opacity. I then added a curves adjustment later to make the image pop a bit more. Would you travel during an “undesirable” time of year if it meant saving a lot of money? What kind of sacrifices would you make in order to make a trip happen? As for the HDR, what do you think? 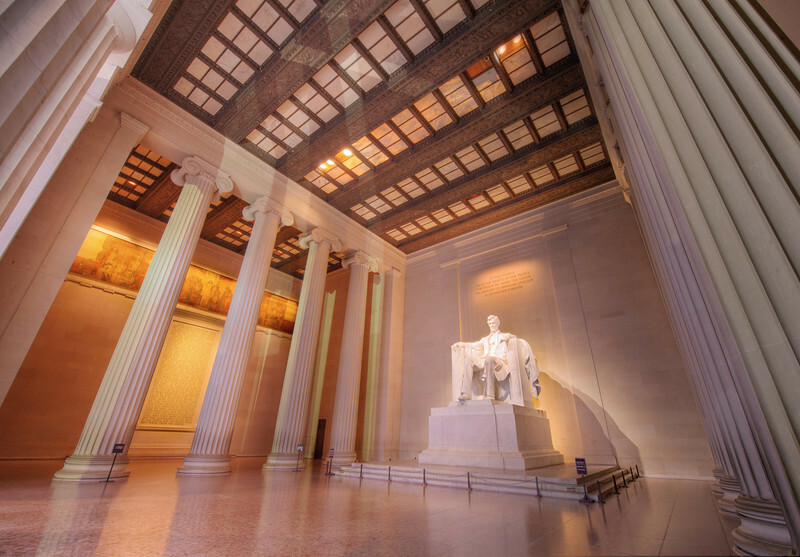 Did you encounter any issues with Park Police and use of your tripod in the Lincoln Memorial? I know at times they can be very adamant about no tripods inside the memorials. I’ve heard that, too, but I had no issues. Rangers even saw my tripod and didn’t say a word. I would still classify the HDR as “realistic”. I think my internal barometer is that if it hadn’t been in the title, I wouldn’t have noticed it was HDR at a first glance. D.C. is a gorgeous city and definitely great for photography. With all of the walking it entails (and how pretty it can be during other times of the year), I wish we visited when it wasn’t quite so cold, though! The National Zoo is pretty incredible, too — and free! I’d recommend coming back in the spring for the Cherry Blossom festival. It’s a bit warmer and the Cherry Blossom trees are gorgeous in bloom.